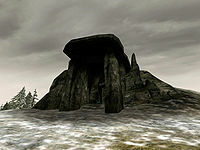 Skogsdrake Barrow is a medium-sized burial ground just north of the Sun Stone. It is guarded by two undead creatures and has six treasure chests that can contain miscellaneous potions, ingredients, armorer's hammers, magical weapons, items, and armor, and even glass longswords. There is also one piece raw stalhrim that requires the Ancient Nordic Pick Axe to harvest it. Skogsdrake is Swedish for Forest Dragon.